What do you understand by Office Filing Procedures? The process wherein all the practices that are followed by the organization are clearly defined and documented in papers. In certain likely or unlikely situations, the steps that need to be taken by the employees and the actions that need to be followed by employees are defined in these documents. Information related to the job description of the employees, the etiquettes related to the work place and specific confidential protocols are documented in Office Filing Procedures. There are many advantages associated with this office filing procedures, which are discussed in this tutorial. Who are the audience for learning Office Filing Procedures? This tutorial is mainly targeted for the professionals who have started their career and who work mainly in departments where most of the work is based on documents such as accounts department, administration department. This tutorial also helps them to understand the process of filing the documents. I is very essential to properly file the documents as wrongly-designed document filing may end up in discrepancies among the different departments of an organization. 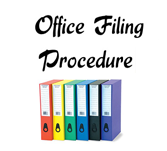 What are the prerequisites required for learning the procedures of Office Filing? Good knowledge and understating of the concept of Business writing and different drafting methods is required for learning the procedures of Office Filing. Also knowledge and understanding of the different methods for filing the documents helps in better understand the concept of Office Filing.